Millions of women all over the world believe they are completely alone when they first discover that they are losing their hair. Suffering what is generally considered a male problem acutely embarrasses them. What is even more devastating is the fact that throughout history and across many cultures a woman’s healthy hair has represented her youth, fertility and femininity. 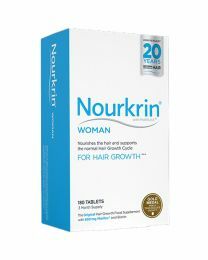 Nourkrin® WOMAN was targeted to address the growing problem of female hair loss affecting as many as 40% of all women at some time during their life. Since then Nourkrin® has helped both to breach this female taboo and to help thousands of women regain a healthy looking head of hair. Nourkrin® is not a wonder drug and should not be presented as such. Nourkrin® built its reputation on sober facts backed by scientific evidence and overwhelming consumer satisfaction. Hair loss and thinning are caused by a number of different types of conditions, and Nourkrin® does not claim to be equally effective against every type of hair loss. What Nourkrin® can promise, however, is that both clinical studies and feedback from satisfied users indicate that up to 90% of users experience visible results after following the Nourkrin® programme. 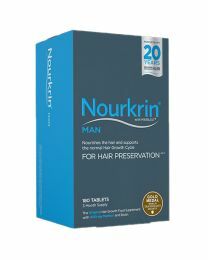 Nourkrin® MAN is an all-natural, drug-free Hair Preservation Programme for men experiencing hair loss and/or hair thinning. The treatment is designed to reduce and prevent hair loss by supporting the existing, normal hair growth from the follicles. In the UK, Nourkrin® has maintained its position as the No. 1 performing product in retail against hair loss for 7 years running. The product is widely endorsed by well-known medical doctors, psychologists, and non-medical industry professionals. This ensures both press and public attention and interest. This recipe for success is currently being adapted in a number of countries all over the world positioning Nourkrin® into a leading global brand in its category.